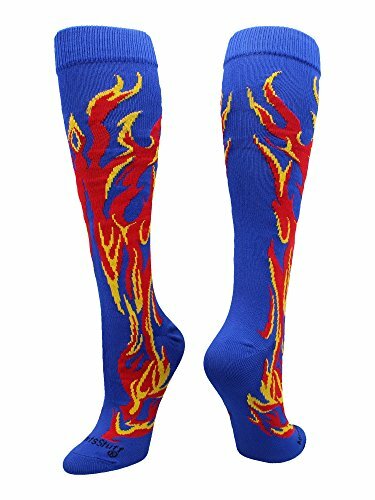 These over the calf flame socks feature a vibrant flames pattern and hit just under the knee. High performance athletic flame socks for all team sports and elite athletes. Shoe Size: Small - Youth 12-4, Medium - Womens 6-9 Mens 5-8, Large - Womens 9-12 Mens 8-11, X-Large Womens 12+ Mens 11+. For boys or girls, teams and gifts. Ideal for softball, baseball, lacrosse, basketball, field hockey, volleyball, wrestling, soccer, football, cheer, kickball and more! PERFECT ATHLETIC FLAME SOCKS: Set the field or court on fire with these fun, crazy and funky flame socks. These over the calf flame socks feature a vibrant flames pattern and hit just under the knee. Ideal for softball, baseball, lacrosse, basketball, field hockey, volleyball, wrestling, soccer, football, cheer, kickball and more!!! QUALITY CONSTRUCTION: Athletic flame socks made with love in the USA!